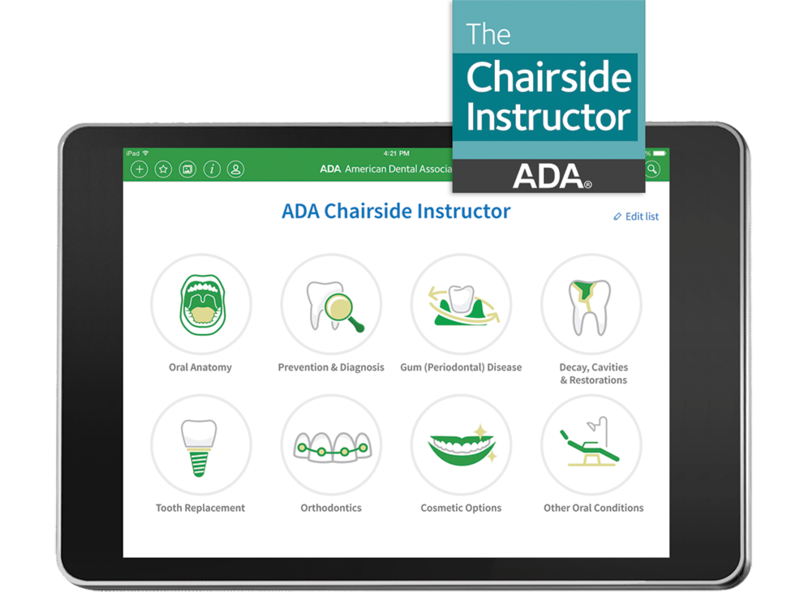 Updated to include over 250 full-color dental images and 25 animations, the ADA Chairside Instructor App is your all-in-one mobile resource for visual patient education. New expanded content now includes these topics: Effects of sugar on oral health; steps of filling a cavity; tooth erosion; gum recession; peri-implantitis; and tobacco use. • Show the silent animations on your iPad. • Draw on pictures and email them to patients. Order the App here at ADAcatalog.org or call 800.947.4746, then complete your download on the App Store. Or, for a free preview, go directly to the App Store.